Solar powered cars today are not a very new thing. But what Art Haines, a mechanical designer along with eight students from Skowhegan Area High School, developed, designed and built the two-seater model vehicle. This Do-It-Yourself (DIY) Hummer-like prototype is a Sun Neighbourhood Electronic Vehicle (SUNN EV) that has a large solar panel mounted on its hood area. It is measured 60 x 84 inches and is capable of reaching a speed of 25 MPH. The DIY kit allows you top choose the color, model and configuration of your choice. 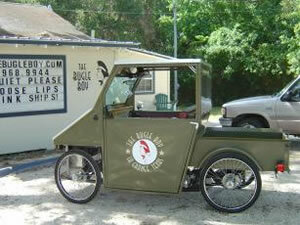 The models available are the solar truck or a one-passenger SPIRIT 3-wheeler. The whole kit should cost you around $5000.